If one of your New Year’s resolutions is to get organized around the house, then you need to start by getting rid of all the clutter. We’re not just talking about the stacks of old magazines and shoes that might be scattered around the house. Instead, you’ll want to “go deep.” That means going through all your closets, the basement, the garage and the attic and look for as many things as you can throw out as possible. The goal is to reclaim as much valuable storage space as possible. That way you can neatly put away the things that you want to keep that aren’t in constant use. As for everything else, that can all be turned over to Junk King Chattanooga. Junk King Chattanooga provides the perfect organizational tools. 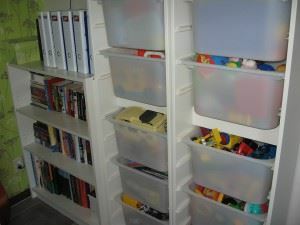 These aren’t plastic storage bins (although you’ll need those for sure!) but a two-man moving crew and huge truck. That is what you need to really make a dent in removing the unwanted stuff from your house. This is not a process that’s going to take all day. That would only happen if you did all the work on your own. With Junk King Chattanooga on the job all your stuff can quickly fly out the door. You’ll be amazed at how fast the Junk King Chattanooga crew moves. Your only role in this task is to tell the crew what you want taken away. You don’t have to pile things up by the door. They will happily go through the house and climb as many stairs as needed to get to your stuff. Once all that stuff is gone, you’ll get a better handle on just what you have left that matters. This is the stuff you want to keep organized in those plastic bins. You might also decide that it’s time for a new sofa or recliner. The best way to make that happen is to create an empty space where the old sofa once was. It’s amazing how quickly that space will be filled up! The cost for this helpful service is very reasonable. You’ll only be charged a flat rate based upon how much space your stuff needs on the back of the truck. You’ll know what that rate is before the job begins. It’s a rate that’s not to change or be filled with hidden charges. Getting organized is easy once you get Junk King Chattanooga to take away all your unwanted rubbish. This entry was posted in junk removal and tagged junk, Junk King, junk removal, organize on December 26, 2016 by Fred Friday. Last updated August 17, 2017 .